Why is December 29th-31st so important for fundraising? Think about all the donations you’ve received so far this year. Now imagine gaining 10 percent more before the year is up. It’s possible! In fact, over 10 percent of all annual giving happens in the last 3 days of the year! A strong year-end push can propel your cause forward with more donations, giving you the power to fuel your mission and do even more good in the year to come. If you want to get people to give that last-minute donation before the ball drops on New Year’s Eve, simply follow the online fundraising best practices in this post. Remember: you already have a network of donors who have supported you throughout the year, all you have to do is inspire them one more time. Make it your goal to compel every person in your donor database to make a donation of any size in the last 3 days of the year. And use the following 10 proven year-end fundraising techniques to collect more donations. Create a unique fundraising campaign for your year-end goal. Your campaign should have a branded online donation page to make donating easy, no matter where your donors are or what device they’re on. The donation page should be complete with your logo and suggested gift amounts. Tip: Design your donation page to reinforce the intention of the gifts being made. If your organization supports endangered elephants, for instance, include a compelling picture of an elephant that demonstrates the importance of your cause. Using Google Ad Grants to promote your donation page? Google requires you to link directly to your website, so be sure to embed your donation form on a dedicated webpage directly on your site that is both mobile-friendly and secure. Donors should also have the option to make a recurring gift to help you achieve your goals on an ongoing basis. Include suggested donation amounts and recurring gift frequencies to help your organization accomplish specific goals in the new year. Provide proof of the good your organization accomplishes by including compelling photos, videos, and benefactor testimonials with every communication and ask you send. Post them on your social networks, send out emails and text messages, and let people know what they can do to contribute to help your cause further its mission. Encourage and make it easy for people to share and contribute to your campaign! Tip: Identify ambassadors within your network that are well-equipped to spread the word about your cause to their own networks. These can be volunteers, donors, or influencers in the space who want to make a difference for your cause. Encourage them to share your campaign to exponentially increase impact and donations. Here are 5 more reasons why influencer marketing is good for nonprofits. The best year-end fundraising emails compel people to give. They’re both meaningful and inspirational. Link to a video showing people the impact of your organization and how your mission specifically makes a difference in the world. Your call-to-action button on emails should be “Donate Now” or “Give Now” to create a sense of urgency. Tip: Send multiple emails in succession showing the progress of your campaign. For instance, 10AM on December 29th and 30th, and 3PM on December 31st. Tell people how much you have raised so far and how close you are to meeting your goal! Want more email marketing tips? Then take a look at 5 Ways Nonprofits Should Use Email To Connect With Supporters. Social media is vital in the final giving days of the year. Many supporters will already be online well-wishing their friends and family, making it a great time to insert your message into their feeds and inspire them to give when the spirit of generosity strikes. Tip: Use a combination of testimonials, videos, and photos to visually share your story through social media. Also be sure to use the appropriate shortlinks and text-to-give keywords to link to your donation page across social networks. You want to get the attention of your donors, right? Emails can be great, but the last days of the year are so saturated with emails—everything from after-holiday sales to New Year greetings to other nonprofit donation asks—that donors may accidentally overlook your message, meaning you should use an additional channel to reach them and communicate the message of your campaign. Tip: Use the 3-to-1 rule. Send 3 pieces of compelling content before sending any donation ask. Do this as soon as possible—you want to familiarize people with your mission now before asking for donations in the last days of the year. In order to ensure that your donors have a convenient online giving experience, it should be a one-click donation experience. As soon as people go to your website homepage, they should click the DONATE button and fill out the form with the least amount of fields required as you can. You want to get them on the page and donating with minimal effort! Tip: Include suggested donation amounts that you can adjust during the campaign. This makes it easy for a donor to click the amount instead of having to enter it manually, and gives you the added benefit of being able to adjust the amounts higher or lower based on the donations coming in and the amount needed to reach your goal. Keep your donors updated along the way. This step is huge and often overlooked by nonprofits. Your donors want to see you succeed, so let them know exactly where you stand and how close (or far!) you are from meeting your fundraising goal. Appeal to their egos by recognizing them on social media, via email or text message. The old adage of “well everyone else is doing it” really does work! Display or link to a live fundraising thermometer on your website, or broadcast it from your office on a Facebook Live video. Call out your donors’ names as they come in to fuel inspiration. This works great for live events, TV and radio as well. Tip: Treat these last days like a “Day of Giving” campaign. It is all hands on deck—every donation helps propel you forward, no matter how small. Micro-donations are still donations, so communicate that with your supporters! A little thank you goes along way! In addition to the donor recognition mentioned in the previous section, you’ll also want to send people personal thank-yous. This can be in the form of an email, text message, or hand-written note, or even a shoutout on social media. Never forget to show your donors how much you care! Tip: If your donors are on social media you can make a post on your wall tagging them. For instance post a “Thank You for Caring!” image on your Facebook wall and tag donors in the photo. They’ll get a notification that takes them directly to the post, which is sure to make them smile. So, the donations are rolling in. You have new donors, hooray! Now what? The biggest mistake nonprofits make is not effectively engaging the new donors they cultivate during year-end. In addition to a thank you, send your new donors a welcome message that shares the mission of your cause in more detail, and invite them to look for information regarding mission updates and future event or volunteer opportunities. Tip: Divide your text message lists into Existing and New donors after your year-end campaign and segment your New Year communications accordingly. Make your message feel personal and thought out, as if it was made specially for them! 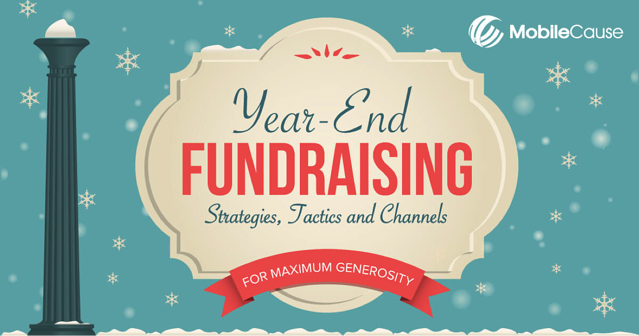 Check out the full Year End Fundraising Infographic for additional strategies and tactics to strengthen your end of the year campaign before the clock strikes midnight on New Year’s Eve!